Does hosted access offer advantages over traditional panel based door access control systems? Brivo Systems, a US provider of 'hosted access' solutions, is the most prominent provider and advocate of a different approach to electronic access control. In this note, we examine Brivo and how they stack up against their traditional 'host bound' access control counterparts. ACS 'OnSite Aparato': For larger deployments concerned about 'cloud' security but still wanting web-accessiblity of system, 'Aparato' is an appliance based version of 'WebService' intended for deployment within a end-user's LAN. Aparato is not hosted externally, but 'hosted' internally. OVR 'WebService': Brivo's video surveillance module is an integrated AVHS instance (covered in a previous update), permits users a cross integrated cloud-based video platform with ACS 'WebService'. ACS includes mainstay access control features, like antipassback support, 128 bit encryption, user-defined database fields, elevator controls support, and facility door lockdown features. Brivo is SAS70 Type II certified and FIPS 201 compliant according to government regulation. 'Aparato' supports a 'Guard Tour' feature that permits system readers to be used in a 'guard clock' fashion that log the travel of supervised security patrols within a facility. ACS5000 EDGE Controller: Brivo ACS works with a customized version of HID's EDGE controller. The Brivo EDGE unit suitable for remote administration and control of 1 door. The EDGE controller is suitable for standalone deployments, and is PoE powerable. 'IP Door Controller', or 'IPDC': The 'next generation' of door controller is the IPDC, with expanded capability of controlling up to 2 doors. Like its EDGE predecessor, the IPDC is PoE powerable. ACS5000: Brivo's primary panel, the ACS5000 is sold in a several versions preloaded with controller boards. UL listed and FIPS 140-2 versions are available, and regardless of initial configuration the basic chassis is expandable to control up to 30 readers per enclosure. Readers supporting these general format are compatible with Brivo and this list covers the majority of card credential formats used today. Brivo reports cost targets of $500 per door (less labor and locking hardware) and $15 per month hosting service fee per door. However, pricing for discrete hardware and hosting services is not publicly available. Brivo's up front costs are significantly lower than traditional systems. When including the additional hardware and installation labor cost, a typical Brivo controlled opening costs around $750 - $1200 per opening, compared to $900 - $2000 per opening cost for traditional hardwired 'host bound' access controlled opening. A cost/benefit analysis shows that for a 8 door access control system, Brivo has a lower cost of ownership until month 10 or 12. This estimate assumes that for an 8 door system, a traditional 'hardwire' system costs an additional $1200 in hardware upfront. The monthy 'hosting' fee for the same number of doors costs around $120 per month. These components can add several thousand dollars in cost and ongoing maintenance to a traditional 'hardwired' access control system. For a typical 8 door system, the additional cost of these components can add $75 to $150 per opening. 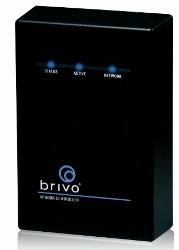 However, using Brivo requires the user to pay a recurring 'hosting' fee for each door, typically around $15 per month. This fee covers the cost of moving the same functions addressed by the 'Headend' panel to the cloud. Other costs associated with Brivo are local internet connection and general network administration, however most enterprises view these as general overhead costs, since they already apply to general commercial computer networks. Acquisition costs aside, a Brivo system provides an access control system whose 'headend' is web accessible, decentralized, backed up, and maintained with a high system 'uptime' in a professional datacenter. However, these benefits can be obtained when using a 'hardwired' system with additional costs and configuration. The most economical choice between the two options will depend upon the IT strengths and resources of individual end users. If a customer is rather 'light' on IT resources and competency, Brivo may ultimately be a better fit despite it's higher lifetime costs. However, if a customer already has a well-developed IT infrastructure and support team in place, they will likely capture 'hosted' benefits at a lower cost.